If you’ve ever been struck on the elbow by a pitch, you know how painful it is and how it can throw the rest of your game off. To prevent this from happening, batters now wear protective gear like the Evoshield Elbow Guard. The question is, does this elbow guard really deliver or is it just hype? Let’s take a close look. This baseball elbow guard was built to protect you from 90+ mph fast balls. If you’ve ever been hit by one of those you know how painful it can be. With this you need not worry about it so you can focus on your game. Second, the guard is built from very solid material, much stronger than plastic or foams. One of the problems with traditional elbow guards is they’re too flimsy. After being hit by a fastball it breaks into several pieces. Clearly that was one of the issues that Evoshield wanted to address, and they did so very well. While the elbow guard is very durable, it somehow manages to be light weight. Because of this it doesn’t feel like you’re carrying something heavy on your elbows. In fact it’s as if there’s nothing there at all. These Evoshield Elbow guards are designed to do the same thing. They do a great job to protect your elbow, but it’s no good if it gets in the way of your swing. Fortunately that isn’t the case because the Evoshield is so light. One of the secrets lies in the custom molding technology that starts soft and hardens in minutes, providing you with the right level of protection. Because of the way the elbow guard has been designed, it becomes a snug fit. It won’t slide off while you’re swinging the baseball bat. Furthermore, you can mold the guard to your left or right elbow with ease. This saves you the expense of buying another one. Once you’ve fitted the elbow guard on, try taking a few practice swings and you’ll notice no difference when it comes to hitting control. 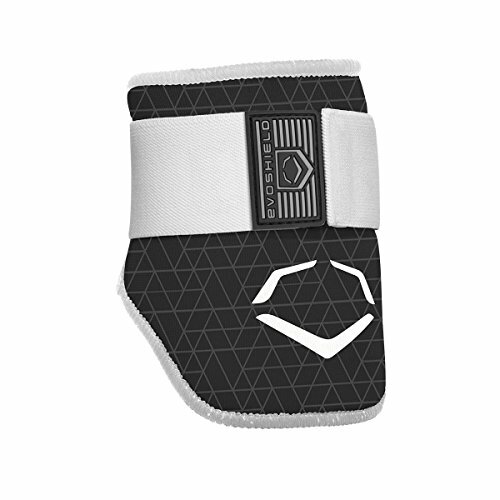 As many have noted, the first thing you’ll notice with this youth Evoshield elbow guard is just how light it is. As soon as it’s on, you can focus on protecting the strike zone and not worry about getting hit by an inside pitch as you’re protected. Due to the way the elbow guard molds around your arm, there’s full protection from wild pitches and fastballs. The remarkable thing is it’s able to do this without slowing down your swing, which generic elbow guards do. The bottom line is that with these specs you will be able to reach inside the pitches even at the outer corners with little difficulty, making your life as a batter that much easier. The Evoshield protective gear makes full use of Evoshield’s Gel to Shell Technology, which is what allows the elbow guard to be light, thin and yet strong enough to withstand powerful pitches. Don’t mistake these for foam or plastic as those are bulky and very stiff, not to mention uncomfortable. Evoshield on the other hand, is a proprietary, lightweight and thin composite material that conforms to your elbow and arm, ensuring a proper fit. The material looks kind of soft, but rest assured that it has been designed to withstand tough pitches under varying conditions. Due to the way the material has been processed, you get a special protective layer that distributes the impact of a hit, eliminating the pain and discomfort. Gel to Shell is also available in other Evoshield products, a testament to how good it is. Besides the Gel to Shell, the elbow guard also makes extensive use of dispersion technology (DSP) to protect your elbows. As mentioned earlier, what DSP does is diffuse the effect of the hit and spread it across the gear’s multiple layers. As the force is dispersed, it is scattered along the surface area so that it isn’t felt upon impact. In other words, what the DSP does is spread the impact around rather than absorb it, which is why you don’t feel it. And thanks to the DSP and Gel to Shell, the gear doesn’t need to be bulky to be effective. Reviews for the Evoshield have been very positive with most commending it for the durability. Albert of San Diego says the Evoshield had protected his elbow “several times” since he started using it, while Doug of Illinois said it is very easy to put on and remove. These are just some of the positive reviews that have been posted online, and they’re indicative of how well designed the guard is. The Evoshield Elbow Guard provides superb protection without getting in the way of your game. Rather than compromise your swing with a makeshift protective gear, you should use the Evoshield and get the protection you need. It’s durable, reliable and affordable, which is pretty much all you need from these products. This just might be the best elbow guard in baseball.